When it comes to local search results, Google strives to display information that’s relevant and consistent. This is demonstrated by a recent rule change around phone numbers displayed in local search ads. Google may now override phone extensions in AdWords search ad creative, if it believes that the call extension a business has provided for organic search, via Google My Business, is more relevant to the user. For example, Google would rather provide users with the phone number for a local pizzeria, auto body shop or florist, rather than corporate head office. This prevents users seeing different phone numbers in search, local search and Google Maps results on the same page. It also creates issues for businesses that utilize multiple numbers for conversion tracking purposes. If your business has provided Google with business information via Google My Business, and you utilize call extensions with different numbers, for tracking purposes or to centralize certain types of calls (e.g. via a call center), you may well be impacted by this rule change. However, advertisers can opt out by completing a form requesting that their extensions remain as they are. Many businesses like using a call center call extension because having only one phone number means conversions are easier to track. Losing control of which phone numbers show up as call extensions means losing the ability to track call conversions (which can be a problem for conversion tracking). 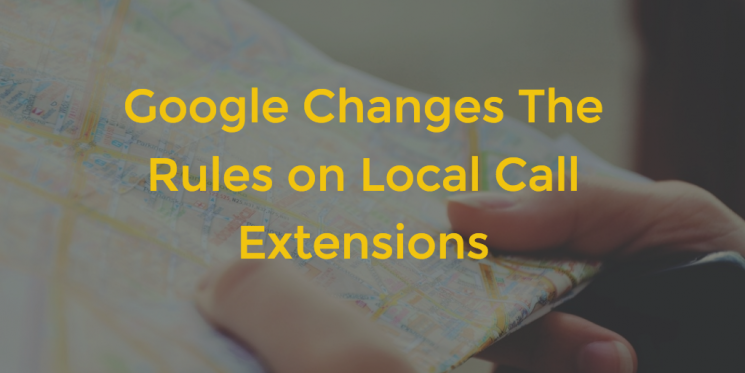 Google says it is working on a way to resolve this tracking issue, so that these dynamic call extensions can still be tracked. But that solution does not exist yet. So between now and the time that a solution is offered that addresses these issues, advertisers are out of luck unless they choose to opt out. Google is also saying that if you do opt out you may not show an ad extension at all (even the ones you’ve had in your account for years with your preferred phone number) which may affect ad rank, position, and CTR. Not sure where your call extensions should be going? Give Kiosk a call.